Construction Management | Fancom Connects Ltd.
Construction management in the context of communications infrastructure is the active review of all activities and elements that together create the entire communications network of a building. The process often occurs after the construction schedule is created and is punctuated with several milestone inspections. At all check points, we seek compliance to speciﬁcations developed during the detailed design development and creation of construction documents. 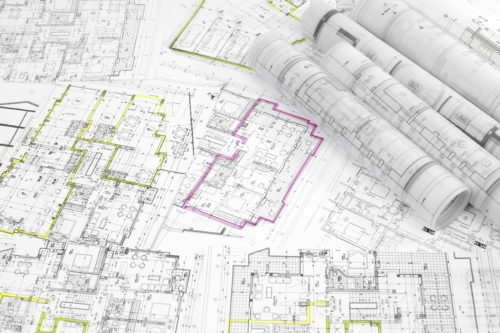 If design speciﬁcations are not being met, appropriate site instructions may be issued to rectify non-compliant actions or a change order may be issued if circumstances require a change from the original speciﬁcations. Slab – The conduit/cabling is often encased in concrete. Inspection prior to pouring the concrete slab is critical. Making corrections after concrete has been poured is very costly and time consuming. Structural Steel – Conduit and cable pathways are designed with advance knowledge of intended structural design. If structural steel is not erected as designed, costly pathway and conduit changes may be required. Conduit Installation – Protective conduit is often required for ﬁbre optic and copper cabling. Conduit type and installation methods vary signiﬁcantly and are dependent on environmental conditions inside and outside the building, the quantity of cabling and the various media through which the conduit passes or to which it is attached. Cable type and installation methods are numerous. Purpose and location are the prime determinants in cable speciﬁcation. Cabling should be labeled as to its point of origin and eventual destination to avoid costly trouble shooting and allow for efﬁcient preventive maintenance. As well as installing new cabling according to speciﬁcations, all abandoned cabling should be removed. Equipment – Speciﬁcations for equipment is often performance based. Installation of equipment also needs to adhere to speciﬁcations to maximize network performance, minimize trouble shooting and allow for optimal preventive maintenance. During Construction Site Inspections – Regular site inspections and corrective actions when necessary ensure that the overall communications network is created as designed. Site instructions or corrective change orders may be issued to correct substandard installations. Weekly or monthly construction reports may be required and generally a ﬁnal construction report is issued prior to turning the project over to the owner. Post-Construction – The period following construction includes commissioning which should include training for operators on installed systems, passing along warranty information and the review of manufacturer’s operation and maintenance instructions. As-built drawings should be provided to the project owner as a record of exactly what the ﬁnished building contains in all respects. Close-out documentation such as warranty applications and certiﬁcation records should also be provided.